Do you often feel that you could and more importantly should be better at playing your musical instrument after the amount of hours you put in? Are you tired of seeing people who hardly seem to do half as much practice as you progressing twice as fast? Can you play pieces well at home but find they fall apart during lessons or performances? If you're fed up with practicing harder, but are not seeing the progress you know you deserve to be making, then I have both bad news, and good news. The bad news first: you may be practicing HARDER, but you need to be practicing SMARTER. Make Your Practice Perfect is the course that will transform your music practice technique. One of the most common problems a music student runs into is the 'play it at home' issue. When you practice in private, everything goes well. But in front of your teacher or an audience, you can't hold it together. Does this sound familiar? I know that I've been there, done that and got the T-shirt! You're no longer alone. You will learn how to break down this problem and the SIMPLE WAYS to overcome it. Guaranteed! And see case studies of music students like you, who have used my methods to overcome their issues, and move forward in their careers. 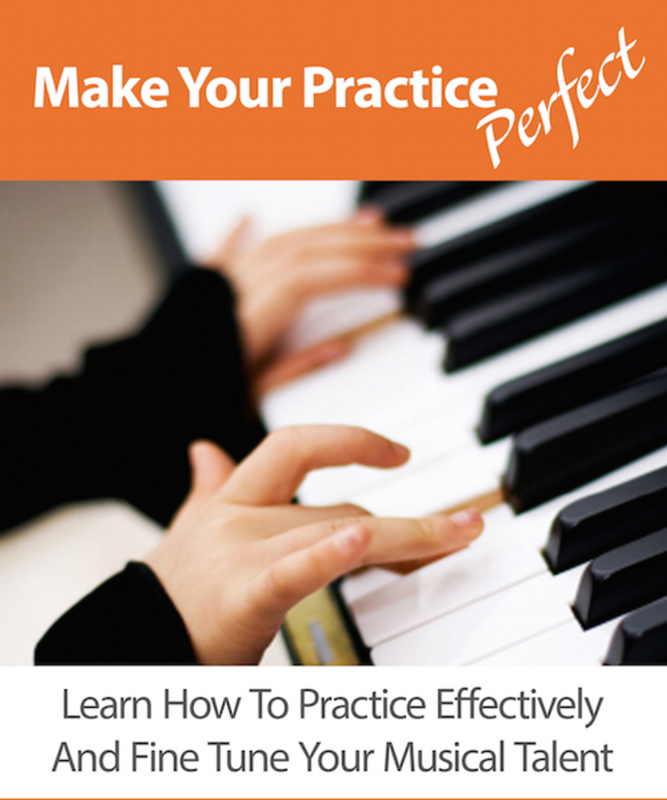 Make Your Practice Perfect helps you make the most of your practice time. Fine-tune your practice technique to be both efficient and effective. Use my tips to start practicing smarter – not harder. Identify your practice problems, learn how accurate you are, and recognize the habits which are wrecking your practice productivity. Learn vital information on the relationship between how your brain works and how to practice music effectively. Discover the 12 keys to musical success. Apply these, and hear your playing improve more than you ever dreamed! Get extra tips and advice on using games in your practice sessions, how to prepare for concerts, exams and competitions, using practice software, and how to use a weekly focus to supercharge your progress. After over 20 years of teaching and coaching students of all ages, Simon Horsey is perfectly poised to help any student achieve their potential. During his time in education he has had the pleasure of teaching Music (on a class and individual basis), Debating, Accelerated Learning Skills and Theory of Knowledge to school and university students across the world. As a music teacher Simon realised that most music students are never really taught how to practice effectively and his research into smarter, more efficient and effective music practice technique resulted in the book Practice Makes Perfect which ultimately developed into the online course Make Your Practice Perfect. He has also published the first of a three volume series of interactive books for the iPad, Essentials Of Music Theory: How To Read And Appreciate Music, teaching music theory using multimedia content and interactive quizzes and to help students learn, . Simon's interest in making music learning and practice more effective naturally developed into research on accelerated learning and memory in order to devise techniques to help students learn more efficiently across all subjects. This culminated in the introductions of ALPS (Accelerated Learning Programme for Students) at the schools in which he taught consisting of work on learning, memory, self study, revision and exam techniques. As these ideas developed he was also invited to give guest lectures at several international schools, universities and companies. Having worked with adults in addition to school and university students, Simon has a deep insight into how the learning process works (or doesn't work) across all age groups. His courses are deigned to be used by students of all ages, because it is never too late to start learning more effectively. And just to prove these methods are as efficient as they are effective, in addition to his books and courses Simon is also a prolific composer and is currently studying for a PhD. Musical progress doesn't come from working harder; it comes from working smarter, and knowing how to practice. Learn how to practice more efficiently and effectively starting today because it will help you make the progress you know you should and could be making. Yes, whatever musical instrument you play. This course teaches you how to make your music practice more efficient and effective helping you achieve more progress in less time. It also helps you become a more confident performer. Do I really need to learn how to practice? I practice all the time! If you want to achieve your potential, then yes. If you want to learn pieces and technical exercises faster, then yes. If you want to get the most value out of your music lessons, then yes! Learning practice technique helps in all these areas, and in fact, several of the research articles that show that learning an instrument helps make you smarter cite knowing how to practice effectively as one of the reasons for the increased chance of academic success for music students. Here are some quotes from people who have read my book Practice Makes Perfect and used the information on my website. I bought this for my daughter and ended up reading it myself first. I learned piano when I was younger and reading this inspired me to want to start again. If only I had known all this when I was learning then I may never have become frustrated and given up. Thank you! If you play and instrument, you need this book! Along with hundreds of other emails saying how much my practice methods have helped students of all ages make more progress on their instrument and how their investment has paid off over and over again in terms of time and progress. So, invest in yourself and join hundreds of others who are supercharging their musical progress. Sign up for the Make Your Practice Perfect course now!